Rabbi Mark Cohn of Winston-Salem’s Temple Emanuel will tell the stories of the objects that the Temple loaned to the Museum for Faith: Five World Religions. 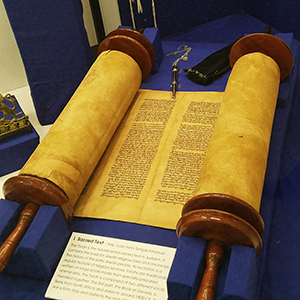 One of the showpieces of the exhibit is a Torah made from at least two different scrolls: a portion from late 18th century North Africa and a portion from mid-19th century Italy. The Temple also loaned a menorah, amulets, a cup, and a number of other artifacts. Attendees are invited to bring a bag lunch. Drinks and dessert will be provided. Admission is free.